Two apps, the Iframe app and the Text app, let agents access additional information from the Zendesk Support agent interface. This article describes the two apps and how to install them. An iframe is an HTML element that lets you nest one web page in another web page. The Iframe app is designed to let Zendesk Support agents quickly flip to a web page in the agent interface and then flip back to their tickets without interrupting their workflow. This can be especially useful if agents use a page to look up things like orders or other data. Note: The Iframe app was formerly called the Sidebar Icon app. The app can only be installed in new Zendesk Support. You can embed a lot of different web pages in the Zendesk Support agent interface with the Iframe app. However, not all pages will be displayed properly and some might be displayed but then exhibit strange behavior. A rule of thumb is to choose web pages that are very simple. Also, some sites actively prevent other web sites from loading their content in this way. They do this for security reasons so hackers can't pretend to be those companies. When this happens, you’ll see the Iframe app but there won’t be any content when you click it. Important : The latest versions of Firefox or Chrome browsers may block web pages from being loaded. 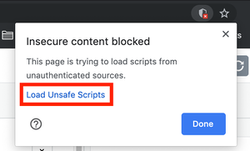 To view the pages, agents must click the shield icon in the browser's Address bar and agree to load an unsafe script (Chrome) or to disable protection on the page (Firefox). Reason: The browser detects and blocks any attempt to request an unsecured HTTP page through a secured HTTPS connection such as Zendesk Support's. The browser blocks the page because the page can be read or modified by attackers even if the page is served over HTTPS. For more information, see this article on the Firefox website and this post in the Google Chrome forum. Click Manage ( ) in the left nav bar, then select Marketplace from the Apps category. Click the Iframe app icon. Click Install App in the upper right of the page. Iframe URL: Required. Put the link to the page you want to display when agents click on the Iframe app. Enable ZAF SDK support? Optional. If you are framing an internal page, you can allow access to the ZAF SDK. See Iframes in Apps for more details. Is your business Twitter focused? You can embed Twitter’s status page. Here are the Iframe app settings for the Twitter status page. Make sure your agents know how to set their browser to allow the page to load. See the note in the introduction for more information. Thanks go to http://www.transparentuptime.com/2009/01/comprehensive-list-of-saas-public.html and http://delicious.com/lennysan/healthdashboard for a really comprehensive list of SaaS dashboards. The Zendesk dashboard is available at http://www.zendesk.com/support/system-status . The Text app lets you display any text you want in the Apps panel in the agent interface. For example, you can display an important message to agents, provide instructions about filling out tickets, or add a link to your retail system. Click Manage ( ) in the left sidebar, then select Marketplace from the Apps category. Click the Text app icon. Specify a title. Example: "Customer Order Lookup". Specify the text you want to display. If you want to use a link as your text, don’t use <a> tags. Just type out the address you want (don’t forget http:// ) and Zendesk Support will automatically make it a link. To view the text, navigate to a ticket and open the Apps panel by clicking the Apps button in the upper right. We have an internal KB setup as a brand in zendesk. Why can we not load that as an iframe page? We get a blank page and nothing else. There is no shield and I have tried all browsers and they all show the same blank page. This did work previously in a sandbox environment. It doesn't work. No URL is loading. We disabled the ability to embed Zendesk into iframes due to security considerations. You can read more about that decision here: Embedding Zendesk into an iframe to be disabled. I'm not sure why it would work in your Sandbox, though..I'll need to do some research on that. I'll let you know what I find out! Hey Clemens! Which URL are you trying to access? Is it possible to add parameters to the URL through custom fields placeholders? If you are talking about the iframe app, I am not sure what scenario you have in mind so my guess is that you are talking about the text app. Please let me know if it's not the case. The reason this error is displaying is because the website that you're attempting to iFrame has an HTTP header (X-Frame-options) set to SAMEORIGIN for all server responses. If you wanted to add a website to the Iframe app, but that web page has theHTTP header set to SAMEORIGIN, you would need to ask the server provide if they could amend the X-Frame-options from their side. You can check if the URL of a web page can be added against the iFrame app using this tool.